Rediff.com » Movies » Imran-Avantika, Shilpa-Raj, Ram Charan-Upasana: When stars got engaged! Imran-Avantika, Shilpa-Raj, Ram Charan-Upasana: When stars got engaged! Here's a look at star engagements over the years. Soha Ali Khan got engaged to longtime boyfriend Kunal Khemu while on vacation in Paris recently. The happy news reminded us of all the celebrity engagements we've heard of and celebrated in the past. Jaane Tu... Ya Jaane Na debutant Imran Khan got engaged to his longtime girlfriend Avantika Malik at the Malik farmhouse in Karjat in January 2010. The couple got hitched in a lavish ceremony in January 2011 and recently welcomed their first child -- a baby girl. Shilpa Shetty got engaged to Raj Kundra, a London-based millionaire businessman, at his apartment in surbuban Mumbai, in October 2009. Their wedding and reception bash were star-studded affairs. The engagement of Ram Charan Teja and Upasna Kamineni took place at Temple Trees, at the Kamineni Farm House, in December 2011. The Telugu heartthrob's wedding generated a it of interest among his fans. 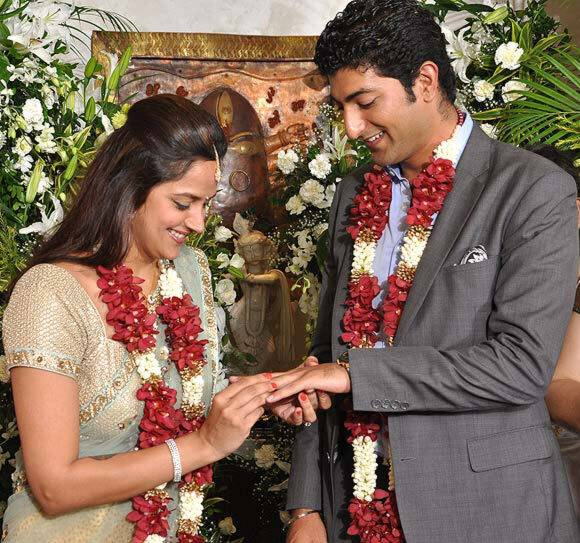 Veteran actors Hema Malini and Dharmendra's daughter Esha Deol got engaged to her boyfriend Bharat Takhtani at Hema's bungalow in Juhu, a western suburb in Mumbai, in February 2012. Their traditional wedding was attended by the who's who of Bollywood. 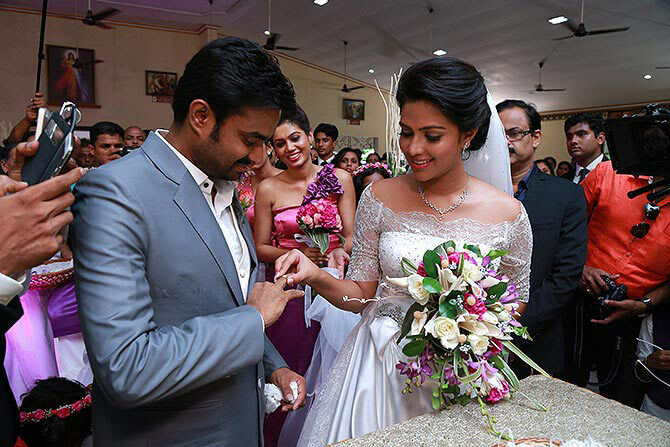 Actress Amala Paul got engaged to filmmaker Vijay in a private ceremony at St Jude's Church, Choondi, in Kochi on June 7 this year. Like her sister Esha, Ahana Deol also got engaged to a businessman Vaibhav Vora in June last year at her mother's residence in Juhu, a posh western suburb of Mumbai. Telugu star Allu Arjun got engaged to Sneha Reddy, daughter of an educationist who runs engineering colleges in Andhra Pradesh, in November 2010. The couple welcomed their son, Allu Ayaan, in April this year. Troublemaker on television Rakhi Sawant famously got engaged on a reality show titled Rakhi Ka Swayamvar, to Elesh Parujanwala -- a Toronto-based businessman at Mumbai's Hotel Leela Kempinski in 2009. 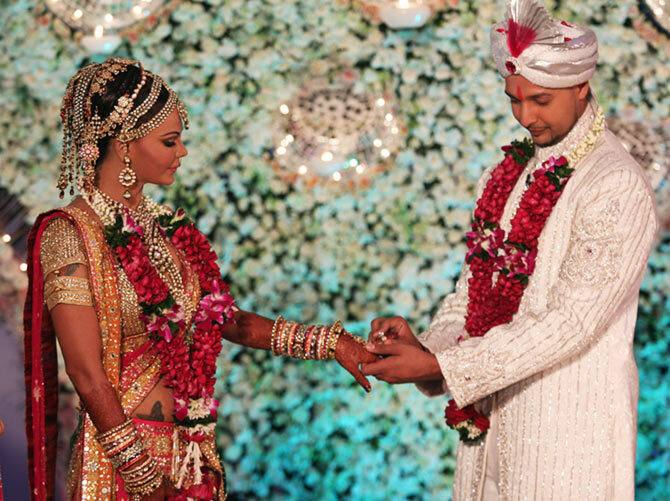 Like Rakhi Sawant, television actress Ratan Rajpoot also got engaged on a television show -- Ratan Ka Rishta -- to Delhi-based software engineer Abhinav Sharma in 2011. Samir Dattani got engaged to Ritika Jolly, a writer, on Valentines day in 2010. Salman Khan's SEXIEST heroine? VOTE!